Students for Justice in Palestine (NYC SJP) is a diverse group of students and community members in New York City organized on democratic principles to fulfill our role as solidarity organizers against U.S. imperialism and Zionist settler-colonialism. We aim to build solidarity with the Palestinian struggle for liberation, as well as the struggle of oppressed people generally. Defend Activist Youth! No to Repression in the Philippines! On January 30th, the Government of the Philippines filed charges against multiple youth organizers, including the national chairperson and secretary general of Anakbayan Vencer Crisostomo and Einstein Recedes. Also issued subpeonas over allegations of the violation of Public Assembly Act of 1985 were Representative Carlos Zarate and Teddy Casino of Bayan Muna, and Nato Reyes of BAYAN. Additionally, the National Democratic Front of the Philippines Peace Consultant Raffy Baylosis was arrested yesterday on trumped up charges, in direct violation of the Joint Agreement on Safety and Immunity Guarantees and the Comprehensive Agreement on Respect for Human Rights and International Humanitarian Law mutually agreed upon by the Government of the Philippines and the National Democratic Front of the Philippines. In 2016, Nerdeen K. and Dan C. of New York City Students for Justice in Palestine travelled to the Philippines with Anakbayan-NY to integrate in the struggle for National Democracy in the Philippines and bring back lessons from that struggle back home, where we can apply them to our work against Zionism in the belly of the beast. Shortly after returning from the Philippines in 2016, NYC Students for Justice in Palestine formally joined the international anti-imperialist alliance the International League of People’s Struggle. We have written in the past of the lessons learned from the trip, and we write this statement in everlasting solidarity and defense of the progressive organizations being repressed through this series of attacks by the Government of the Philippines. While we were there, we built directly and received guidance about our work in New York and in the U.S. more broadly from both comrades Einstein and Nato in different points in time. Einstein taught us the value of assessing our work so that we might understand our failures in order to prepare for the next step, and gave guidance in how to investigate the concrete conditions of the people we are trying to organize. Nato sat with us to explain the conditions of the Philippines and the dimensions of the work that BAYAN participates in, and even helped walk us through plans of action for neighborhoods and universities that NYC SJP was in the process of organizing. For this support and guidance in the internationalist spirit, we are eternally grateful to Nato, Einstein, Anakbayan NY, and the whole of the National Democratic movement, both in the Philippines and here in the U.S..
At the same time as these activists are being repressed by the U.S.-backed Duterte dictatorship in the Philippines, Ahed Tamimi and hundreds of other Palestinian youth continue to resist in the face of Israeli incarceration, despite lengthy prison sentences and trumped up charges brought against them. The torture, sexual violence, solidary confinement and harassment of incarcerated Palestinian youth by Israeli jailers is very well documented. Like Ahed and her comrades, no level of repression can stop the love for their people that the National Democratic activists have which serves as the motive force for their political work. The Israelis are fundamentally incapable of understanding that the reason for the rebellion of Ahed is love, love for Palestine and love for her people. We call on all SJP chapters and Palestine solidarity organizations to mobilize in defense of the targeted activists, and learn from and continue to build meaningful solidarity between the Palestinian and Filipino struggles. EDIT #2 12/20/17: While information is slow coming out, it is now known that Aheds father, Bassem Tamimi, has also been arrested. EDIT #1 12/19/17: At midnight, a few minutes after publishing, it was reported that Ahed’s cousin Nour Tamimi, a 21-year old journalist, was just abducted by Israeli occupation forces. On Tuesday, December 19th, 2017 at 4 AM EEST 16-year old Ahed Tamimi, youth leader and daughter of activists Nariman and Bassem Tamimi, was abducted from her home in Nabi Saleh in the West Bank during a pre-dawn raid carried out by Israeli Occupation Forces. According to Bassem, at least 30 soldiers were involved in the raid and Ahed’s arrest. During the raid, occupation forces assaulted multiple members of the Tamimi family, including Nariman and Ahed’s 14-year old brother, and confiscated their cell phones and computers. Later in the day, after learning that Ahed was being held at a police station near Jabaa village, Nariman traveled there to be present for her daughter’s interrogation, only to be arrested by occupation forces upon arrival. Tuesday’s raid and Ahed and Nariman’s arrests follow on the heels of Ahed’s 14-year-old cousin, Mohammad, being shot in the face with a rubber bullet by IOF on Friday during a protest in Nabi Saleh. Mohammad was put in a medically induced coma for 72 hours and remains in critical condition. A video posted on Facebook by Bassem Tamimi on Friday shows Ahed and Nariman blocking two israeli soldiers from entering their home after occupation forces had just shot Mohammad in the face and fired tear-gas canisters directly at their home, breaking several windows. The Tamimi family is no stranger to brutal Zionist oppression, as family members have been regularly harassed, detained, beaten, and shot by IOF countless times over the years, targeted for their leading role in organizing weekly protests in the village of Nabi Saleh to demand the end of Israeli encroachment on their lands. According to members of the Tamimi family, Nabi Saleh has been raided on a near nightly basis for the past three months. Bassem, Ahed’s father, has been detained at least 11 times by Israeli authorities and has spent over three years in administrative detention without charge or trial. Israel uses administrative detention to incarcerate Palestinians indefinitely and without ever revealing what the allegations are. Under administrative detention, Palestinians can be detained and re-detained indefinitely, a method used to neutralize political action. There are currently over 450 Palestinians in Administrative detention. Mass incarceration of indigenous peoples is a consistent strategy in the toolbox of colonizers, practiced to neutralize effective political actors and normalize the abduction and torture of sisters, mothers, brothers, fathers, children and comrades. However, history has shown that Palestinians and nationally oppressed have resisted this formula and created their own: one that demands resistance in all its forms in the face of repression. Ahed is one of 311 Palestinian child prisoners in Israeli jails as of November 2017. Israeli Occupation Forces regularly abduct, arrest, and abuse Palestinian children and torture them while in custody. On the evening of December 10, 17-year-old Abd al-Khaliq Burnat, son of activist Iyad Burnat, and two of his friends, Hamzah Al-Khatib and Malik Radhiwas, were abducted by occupation forces while they were out getting pizza. And just days prior on December 7, a photo of 16-year-old Fawzi al-Junaidi went viral in which he is seen blindfolded and handcuffed, surrounded by nearly twenty occupation forces. He now faces charges of throwing stones at israeli soldiers in military court. These are just some of the 450+ Palestinians, over 130 of them children, who have been abducted by Israeli forces since the US administration under Trump recognized Palestinian Al-Quds (Jerusalem) as the capital of the settler-colonial occupier state of Israel. This symbolic assault on Palestinian sovereignty has validated and further emboldened the Zionist entity to continue their unchecked hostility towards Palestinians. The arrest of Ahed Tamimi is not an isolated incident, but rather follows suit with Israel’s policies and increased attacks on Palestinians since Trump’s announcement on Jerusalem. As Palestinians continue to mobilize in light of this decision, and for all issues that occur as a result of it, it is imperative that the international community condemns all efforts by Israel to stifle Palestinian resistance. Israel’s attempts to silence and instill fear in Palestinian youth, must be met with outrage, while extending full support to targeted Palestinians so they are not demoralized. We stand against the imprisonment of all Palestinians, especially Palestinain children. We believe all occupied people have a right to resist their occupation by all means necessary. We stand by the Tamimi family in this difficult time and salute their struggle in their firm resistance against Zionist aggression. Photo campaign: Share a picture of yourself or your organization with a sign that shows support for Ahed Tamimi and her family. Organize an action or event: on Friday 12/22 educate and mobilize the demand for freedom for the Tamimi family and all Palestinian political prisoners. This can either be a demonstration, or even just tabling and passing out flyers on the situation. More materials will be provided in the next coming days for this. If you are unable to do either, US residents can call their local representative and encourage them to sponsor the #NoWayToTreatAChild campaign and H.R. 4391, the Promoting Human Rights by Ending Israeli Military Detention of Palestinian Children Act as well as urge them to demand the release of the Tamimi family and all Palestinian political prisoners. For those internationally, demand an end to the treatment of Palestinians who are rightfully resisting colonization, and demand for the release of the Tamimi family and all Palestinian political prisoners. Call your government officials to demand the release of the Tamimi family and all Palestinian political prisoners. We, NYC Students for Justice in Palestine condemn the declaration of Martial Law in Mindanao, in the spirit of international solidarity with our comrades in the National Democratic Movement of the Philippines. It is clear that Martial Law will only exacerbate the suffering of Moro, Lumad, and Filipino workers and peasants and contribute to the already over-militarized presence of the Armed Forces of the Philippines (AFP) in Mindanao. While Duterte claims the declaration is to stamp out the growth of groups like Abu Sayyaf and the Islamic State, the AFP have long been guilty of aerial bombings, extra-judicial killings of activists, burning of schools, and the abduction and murder of indigenous Lumad all around the Philippines, but especially in Mindanao. In 2016, two of our members travelled to the Philippines in a solidarity exposure trip with AnakBayan NY, where they saw firsthand the effects of state repression and the general conditions of the Filipino people. Many activists and elders of the movement talked with NYC SJP about the legacy of the Marcos dictatorship, and how martial law attempted to suffocate the movement for genuine freedom and democracy in the Philippines. While Duterte threatens to extend martial law throughout the country, it is clear that it will only benefit the big bureaucrats and landlords, and pave the way for increased U.S. intervention into the country. Just a few days ago, the Trump regime spoke highly of Duterte’s campaign of extra-judicial killings and pledged to work closer with the Government of the Philippines to further U.S. strategic interests in East Asia. Military law, curfews, extra-judicial killings, checkpoints and search-and-seizures are very familiar to the Palestinian people. The Palestinians have been under military occupation even before the Zionist state was established. Systematized settler-colonialism and apartheid conditions have shaped the experience of the Palestinians since 1948, and until now the West Bank remains under the longest military occupation in the world, Gaza remains under siege and blockade by land, air and sea, and the Palestinians within the Zionist state face draconian laws that determine their rights and relationship to the state on the basis of their indigeneity. While this system seems so strong, in reality it is a weak shell that has a finite lifespan, one whose whole existence relies on the continued support of U.S. imperialism. Like Palestine, the reactionaries in the Philippines also rely on the US to stay in power. We must ask ourselves, who is it that sells the government of the Philippines heavy weapons and tanks? Who is it that has military bases and special forces throughout the Philippines? Who’s counter-insurgency doctrines and programs (COIN) support the AFP’s war against the revolutionary movement of the Philippines, despite years of peace talks? This elucidates how the imperialist system chains both Palestine and Philippines together, in that their oppressors survive through the patronage of the empire, and thus the Palestinian and Filipino peoples liberation depends on the confrontation and defeat of that empire. We call upon all progressive and anti imperialist organizations to voice their support to the people of the Philippines, and join the International League of People’s Struggle to build a broad, international alliance of oppressed peoples against imperialism. *ALL OUT FOR MAY DAY 2017* PALESTINE CONTINGENT 3:00 PM UNION SQUARE OUTSIDE OF WHOLE FOODS. MARCH FOR THE PRISONERS FROM TACOMA TO PALESTINE! As we prepare to march on the streets of New York on International Workers Day, an estimated 1,800 Palestinian prisoners are entering the third week of a mass hunger strike. While their demands — increased family visitation rights, proper medical care, and an end to indefinite detention and solitary confinement — reflect their fight for basic dignity, the heart and body of their struggle lie in the broader fight for national liberation to free Palestine from the river to the sea. The repression that has followed since the strike began on April 17 — israeli occupation prison officials quickly responding by placing strike leaders in solitary confinement, raiding prisoners’ cells, denying healthcare and arbitrarily transferring detainees — is a direct measure of just how fearful the zionist occupation forces are of the revitalization of the Palestinian prisoners movement and, more broadly, of the Palestinian struggle for national liberation. To this end we stand firmly in support of all the heroic Palestinians participating in the mass hunger strike from inside the zionist prison walls and in support of their families, communities and comrades supporting and fighting for them on the outside. We recognize and reaffirm their right to resist mass incarceration, political imprisonment and settler colonial occupation by any means necessary. And ultimately we understand that the Palestinian struggle for liberation is part of a global struggle against US imperialism. As the Palestinian prisoner movement continues to resist from the depths of the zionist dungeons, a new chapter of prison labor strikes and hunger strikes is underway in the United States. It is no coincidence that the same week the Palestinian prison strike began more than 700 undocumented people incarcerated in a for-profit detention center contracted by ICE in Tacoma, Washington commenced a mass hunger strike resisting forced prison slave labor at $1 per day, medical neglect and poor food quality. On International Workers’ Day last year, a group of men incarcerated in several Alabama prisons began a 10-day strike over unpaid labor and poor conditions. Months later in September 2016 on the 45th anniversary of the prison uprising at Attica, prisoners in 40 facilities across 24 states commenced a nationally coordinated strike led by organizers from the Free Alabama Movement in protest of long-term solitary confinement, inadequate health care, overcrowding, violent attacks and slave labor. As prison organizer Kinetick Justice from the Free Alabama Movement stated in response to the strike launched on May Day of last year, “These strikes are our methods of challenging mass incarceration, as we understand the prison system is a continuation of the slave system.” At the time he was serving his 28th month in solitary for organizing a similar protest in 2014. The labor that prisoners in the United States produce is largely invisible. From manufacturing ikea furniture, military uniforms, test booklets, lingerie and blue jeans to baking bread to fighting forest fires, prison slave labor is far more present in our daily lives than many of us care to admit. And beyond production for export, prison slave labor is increasingly used by private corporations to subsidize their internal operations and increase profits. While the neoliberal privatization of the prison system has been underway since the Reagan era of the 1980s — the market for private prison companies has shifted in recent years from contracts with the Bureau of Prisons to contracts with Immigration and Customs Enforcement. Immigrant detention remains the fastest growing profit-generator for companies like CoreCivic (formerly Corrections Corporation of America) and Geo Group. On the U.S.-Mexico border the connective tissue between the US imperialist empire and the settler colonial state of israel is made plain. While we tend to focus on the fact that the U.S. funnels $4 billion a year in foreign military funding to the state of israel (over 50% of its total military aid budget), subsidizing the occupation, this figure doesn’t take into account U.S. government contracts granted to israeli weapons manufacturers in the private sector. Companies like Elbit Systems, israel’s largest publicly traded arms and security company, have scored major contracts post 9/11 from the Department of Homeland Security to supply drones and high-tech surveillance towers to U.S. Border Patrol. The same technologies used to occupy, surveil and bombard Palestinians now facilitate the mass incarceration and deportation of undocumented migrants from Central America and Mexico fleeing U.S.-backed death squads and neoliberal trade policies that have decimated their home countries. One need not look as far as the militarization of the southern border, though, to see the collaborative efforts of the U.S. and israel. In April 2016 when over 700 law enforcement agents from the Department of Homeland Security, FBI and NYPD raided the Eastchester Gardens housing project arresting 120 Black and Latinx youth in what was the largest police raid in New York history, the scene easily could have taken place in occupied Palestine. Today, the Eastchester 120 are locked away in federal prisons strewn throughout NYC awaiting trial. As the prison strike rages on in Palestine, the walls of the Metropolitan Detention Center in Brooklyn where the majority of the Eastchester 120 are being held are shaking, the walls of the ICE detention center in Tacoma, Washington are cracking. The successes of anti-imperialist mass movements in places like the Black Belt and Aztlan have a direct impact on the growth of the revolutionary struggle in Palestine. While only the Palestinian people have the ability to free Palestine, we’ve said before that the “advances of one anti-imperialist revolutionary struggle both objectively strain the resources of oppressor nation(s), and subjectively inspire anti-imperialist struggles around the world by proving these struggles are possible in practice”. Thus, internationalism is not a moral platitude or a simple nod of the head, the liberation of all oppressed nations demands its existence. To participate in the struggle for liberation necessitates both revolutionary defeatism and revolutionary optimism. To be anti-imperialist, and defeatist in the revolutionary sense is to hope that the US government loses and the Viet Cong wins. At the same time, we are revolutionary optimists: while the movement in the U.S. is at a low level of struggle, genuine resistance to imperialism is growing, and it is our task to support such resistance. U.S. global hegemony, like zionism, is in crisis: its fragility can been felt in its failed strategies in Syria and Afghanistan and the defeat of neoliberalism in the presidential elections. The arms dealers and oil executives’ fear of emergent, rival imperialist blocs and growing mass movements can be smelled in the dormant fires of Ferguson and the guerrilla zones of Mindanao, in the ruins of Mosul and the scorched olive groves of Palestine. When we say it is right to resist, we mean it is justified for those who have nothing to rebel against those who have taken everything. This May Day, we march with the International League of People’s Struggle for the workers, for the immigrants, for the prisoners, and for all those who struggle against U.S. imperialism, wherever it rears its ugly head. NO TO U.S. WAR ON SYRIA! On April 6 just after 8:30 p.m. the United States launched 59 Tomahawk cruise missiles at a Syrian Air Force base in Homs province. While the Trump administration sought to paint the offensive as a justified retaliation for the chemical attack in Idlib alleged to have been carried out by the Syrian government, we know all too well that the US empire has no moral qualms about the victims of the Idlib attack or the entirety of the Syrian people for that matter. Our position as anti-imperialists must be consistent and clear: US “humanitarian interventions” have only ever resulted in the death and decimation of entire nations, and in the case of Syria, further US intervention will only prolong the war, lead to the death of more innocent Syrians, and serve U.S. capitalist interests. The US has thrown its airpower into a campaign of terror in Syria and Iraq for 973 days and counting, ostensibly under the pretence of fighting the Islamic State and other rebel groups. During that time there have been 19,527 airstrikes across these countries, with an estimated 2,978 civilians killed and many more displaced. The most devastating of these airstrikes came in the Iraqi city of Mosul on March 17, in which over 300 Iraqi civilians were killed, making it the one of the worst US led civilian bombings in a quarter century. In the past two months, the United States has deployed thousands of US soldiers in Syria and Iraq, top US generals have demanded more troops in Afghanistan, and Yemen has been hit with more US bombs and raids than ever before. As organizers in the United States, we must condemn in words and actions the recent expansion of the United States’ military presence in the region, specifically in Syria. We have discussed our view of this inter-imperialist conflict and our position remains unchanged. The shift in US military intervention, no longer limited to devastating airstrikes, now includes the addition of 500 US marines and Army Rangers in Syria, as well as the deployment of 2,500 Marines in Kuwait to be used in combat operations in Iraq and Syria. We also cannot forget that the US has engaged in a steady buildup of forces in Iraq, now numbering over 5,000. The facts suggest the US is preparing for a larger ground presence, a move that would cause the continued carving up of Syria. This constitutes the possible threat of regime change imposed by imperialist forces and allies, such as the United States, Turkey, israel, the Gulf states, and others. We vehemently oppose the intervention of all imperialist forces in Syria and denounce American complicity in denying the Syrian and Kurdish peoples the right to self-determination free of outside coercion. Since 2011, the world has witnessed a brutal conflict between the Syrian government, rebel factions, and their respective allies. Over 300,000 have been killed, and millions are displaced within and outside of the country. While both sides of this conflict have attempted to leverage international support, we understand that neither the Syrian Government nor the organized political and military opposition have served the Syrian people or their democratic aspirations. While employing rhetoric of revolution, the armed and political opposition has been consistently funded by the US and its allies, who have repeatedly attempted to co-opt the rage and pain of the Syrian people for the benefit of US strategic interests. It is clear that these forces have been co-opted by outside powers which seek to impose their own agenda in Syria and blunt the revolutionary potential of the Syrian and Kurdish people. Meanwhile, little doubt remains about the position of the Syrian government to the values of democracy or human dignity. As an anti-imperialist youth organization, we can not stay silent about US intervention in Syria. The United States has played a central role in shaping the conditions that birthed ISIS beginning with its occupation of Iraq in 2003 and further fueled the current conflict by supporting reactionary and competing opposition groups in Syria. We understand the United States’ stated goal “to defeat ISIS” is nothing but an excuse to intensify airstrikes, raids, and escalating military occupation; ensuring its hegemony in the region. In the process, thousands have been killed, leaving generations with irreparable damage. We strongly condemn the US’ role in Syrian affairs, including the Trump regime’s rejection of refugees caused in part by this American imperialism. The Syrian & Kurdish people must decide their own fate, and all actors who seek to undermine Syrian freedom and self-determination should be held accountable. To this end, we recognize that our enemy abroad is our enemy at home. The enemy that leads the world in incarceration, the enemy that murders Black and Brown people with impunity and allows fascism to rise is the same empire that facilitates Zionism and rains bombs on the heads of people all around the globe. While we respect the diversity of opinion concerning the Syrian conflict, we call for the unity of pro-Palestine and anti-imperialist organizations around the country to mobilize around halting the escalation of US intervention in Syria and in the region as a whole. Our primary duty is to prevent our own government, one which has invaded and destroyed dozens of nations since WWII, from continuing to exacerbate the conflict. We must be clear that regardless of the use of a “humanitarian” or “counter-terrorism” framework to justify intervention, the United States has no role in the Middle East but to leave it. Neither guise will cover the strategic chaos the US encourages and benefits from as it seeks to expand into new markets and ruthlessly exploit existing ones. The lack of a formal declaration of war does not sidestep the reality that the US is at war with Syria. This intentional informality is symbolic of the hidden face of modern imperialism, as seen in Yemen, Somalia, Libya, and Pakistan among others. We will not allow the Middle East to be destroyed at the feet of the world’s deadliest war machine. As Palestinian & MENA diaspora and comrades in the United States, we have no option but to collectively resist by building an anti-war movement that can halt American intervention in Syria, Palestine, and around the world. Just as we support the right of the Palestinian people to resist Zionist settler-colonialism, we must unconditionally uphold the right of the Syrian & Kurdish people to resist American and all imperialist military occupation, using any method they deem necessary. U.S. IMPERIALISTS – NUMBER ONE TERRORIST! ALL OUT AGAINST ZIONISM AND COLLABORATION, LONG LIVE MARTYR BASIL AL-ARAJ! Basil al-Araj, a beloved intellectual and activist who lived and died on the principle of resistance, was murdered by the Zionist security forces in an early morning raid last week. Basil was no stranger to the repressive nature of the PA, having been arrested and held in Palestinian Authority prisons for months before launching a hunger strike in protest. Upon his and his comrades release, the Israelis repeatedly raided his family’s home in Ramallah in search of Basil, but he was able to evade capture for months before being killed resisting the occupiers. The shameless collaborators in the Palestinian Authority freely gloat about their betrayal of Palestine, referencing the arrest of Basil al-Araj and five other resistors, PA President Mahmoud Abbas was reported in Der Spiegel in April of last year saying, “Our security forces are working very efficiently to prevent terror. Just a couple of days ago, three young men were tracked down and arrested. They were planning an attack. In this context, our security cooperation with Israel is functioning well.” Adding salt to the wound, in the protests that followed in the past few days, the PA security force has beaten, tear gassed, and shot live ammunition at protestors struggling against the traitors in the PA.
For Basil, for Omar Nayef Zayed, and for all those betrayed by the PA collaborators, rally with us and the Palestinian Youth Movement (PYM) today, at 5:30pm at 115 E 65th Street. PA: END SECURITY COORDINATION WITH ISRAEL OR DISSOLVE! LONG LIVE THE MARTYR BASIL AL-ARAJ! Today, March 4th, NYC SJP joins Anakbayan NY in their call for an anti-imperialist youth contingent at the People’s March for Education Justice. We demand an education that reflects the needs and history of marginalized people here, especially at CUNY, a university that has the highest population of Black and Brown students in the United States. We memorialize the ongoing struggles to elevate decolonial curricula in CUNY and elsewhere, as ethnic studies programs are slashed in favor of whitewashed settler colonial history. Our role as Palestine organizers is one of unconditional support and participation in a movement to liberate CUNY for the people. We understand the historic demands of free tuition, open admissions, democratic governance, and a revolutionary curriculum which teaches oppressed nationality students their history, stemming from the 1969 Open Admissions Strike. We remember the lessons taught to us by Palestinian students who visited on the Right2Education campaign from Bir Zeit University and other universities in the West Bank. On one hand, U.S & Israeli coordinated military tactics are deployed in IDF raids on Palestinian universities. This serves as a barrier to education in Palestine, whether done to target specific political activity or for general intimidation. Students on their way to school may be routinely stopped, questioned, and detained. Israel intentionally stunts the accessibility of education for Palestinians, raiding the universities in the West Bank, bombing the schools in Gaza, and propagating naked cultural genocide on Palestinian students within 1948 historic Palestine. Similarly, our schools in New York are under another sort of occupation: the New York Police Department. Beyond navigating the general criminalization of our communities, Black and Brown youth must also deal with the NYPigDepartment’s armed officers in schools, metal detectors in the hallways, truancy cops, and the ever-present threat of I.C.E. Oppressed nationality youth are thus doubly prevented from having a just and quality education: the intentional underfunding and neglect of public education in Black and Brown communities means only 14% of Black and Brown high school graduates are college-ready in New York City. In addition, Palestinian and other oppressed nationality students in many US public schools learn about their history from the viewpoint of the oppressor. 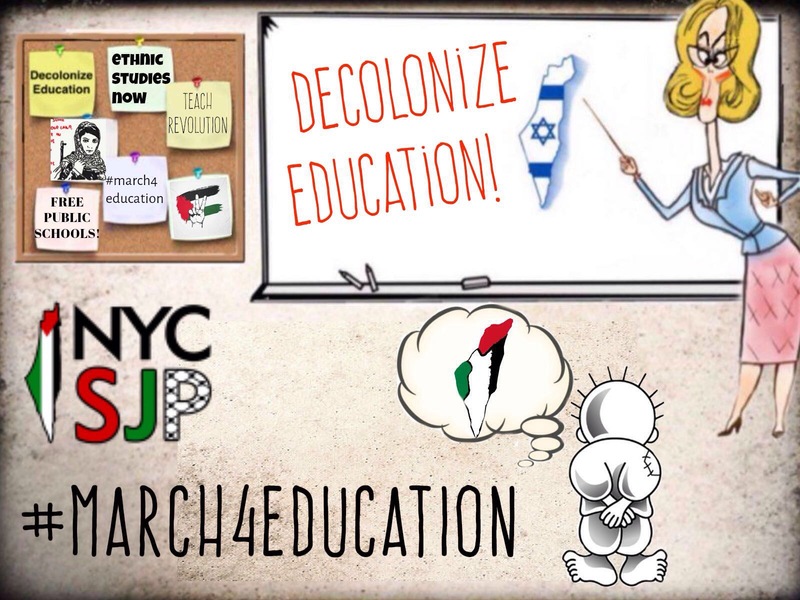 As NYC SJP, we know what we are taught about Palestine and other colonized countries we come from has never been reflective of the lived experiences of the diaspora who are educated in them. Upholding Zionist narratives in school sends a message to these students that their whole identities or histories are not welcome in the classroom. The colonial assumption that “Columbus discovered America” and the erasure of the violence he unleashed on indigenous peoples of the Americas goes hand in hand with similar ideas about the role of Zionism taught in today’s schools. We recognize that the education given to us is not merely propaganda, but part of an apparatus designed to prepare us for exploitation under capitalist class society, and part of maintaining the ideological justification for empire. The U.S. empire would not be able to function if its education system did not indoctrinate us into believing that Puerto Rico is the U.S., Palestine is Israel, and in the crusty decayed corpse that is the American Dream. We stand in solidarity with all peoples unfairly unrepresented in their curriculum, all students with guns in their faces, and all those who must walk through a checkpoint to get to class, whether that is in Bethlehem or Parkchester. Thus progressive education policies should also include a call to social justice teaching, on the Palestinian struggle and beyond. Public education must be thought of as a collective project; the community will not be benefitted from the opportunity that a few individual students may have to “choose” to go to a charter school. We demand an education system that teaches us our real histories, that prepares us to organize for liberation, and most importantly, one that materially benefits our communities. With the election of wannabe-Mussolini Donald Trump, Betsy DeVos – a billionaire advocate of charter schools and defunding of public education – has just been appointed the Secretary of Education. The destruction of accessible education has led to cities like New Orleans, where not a single public high school is left. Although DeVos is escalating the attacks on public education, teachers unions and scientific curriculum, she was not the first to do so, the previous approach to education under Obama and other presidents has assaulted the people’s right to education for as long as this country has existed. However, the urgency of fighting for accessible and just education has never been more apparent in recent history. And as students, we cannot pretend that we will be students forever, or that we are somehow outside of our communities once we enter the university. Our organizing has led us to be attacked by everyone from City Council to the terrorist Jewish Defense League, but we acknowledge that all these attacks are meant to hamper the revolutionary potential of our communities and force them, through a myriad of ways, into an apolitical existence. The student movement should serve the community – and not limit itself to student-specific demands, else we risk rendering ourselves politically irrelevant in the long term. Build organizations and caucuses in your high schools, colleges, graduate associations and teachers unions. Divest from Israel and prisons, from the Dakota Access Pipeline and military industrial complex. Force ICE and ROTC off campus, throw professors like Petraeus out the door, demand a just contract for our educators, and go back to our communities and serve the people. In solidarity with Anakbayan, we aim to Take Back Our Education – away from the politicians and private corporations, into the hands of the people of this city. We call on all youth and students to participate in the March 4 Education TODAY at 9:30 AM in Columbus Circle and 2:00 PM at Hunter College!